Any and all brands of farm and garden tractors – restored, in-process and natural/original – are welcome. Stationary engine display in separate section. Open from 10am to 5pm Friday 22nd and Saturday 23rd, 10am to 3pm Sunday 24th. With over 1000 exhibits expected including vintage working Machinery and engines, live steam, vintage Cars, bikes and tractors, a tractor pull and much much more. Held at Sturt Reserve, Murray Bridge, right on the river allowing access to the paddle steamers and vintage wooden boats, making a beautiful backdrop to a great rally. Join us for the California Antique Farm Equipment Show®! 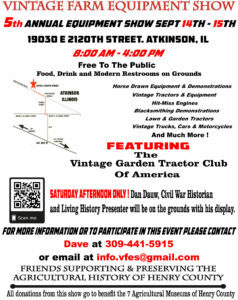 We’ll celebrate John Deere and “Those Poppin’ Johnny 2 cylinder tractors” with lots of fun for the whole family! 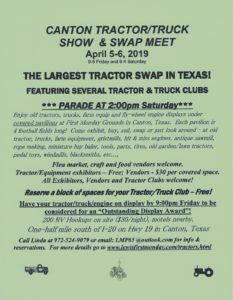 • Tractor Parade – Saturday & Sunday, 10:00 a.m.
• Antique Tractor Pulls – Friday, 3:00 p.m. – 5:00 p.m.
• Bull & Horse Bucking – Saturday starting at 9:00 a.m. Starting at 9 AM we will be plowing the challenging fields of Hereford with any color or brand tractor and garden tractors as well. There will be good food available all day and a hay ride as well out to the fields. Swap meets are a great place to find all sorts of interesting items from around the farm and who knows where. We will be open rain or shine, so bring a coat, umbrella, or sunscreen. You never know what this Michigan weather will do. Kitchen will be serving food all day. Lots of vendors on display. Old Time Plow Days is an event for the whole family. This year we will feature FORD tractors. 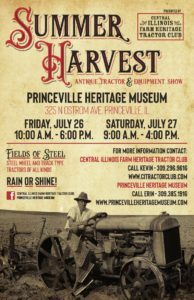 See our threshing machine in action, a working silo filler, antique engines, petting zoo for the kids and tractors plowing. We will have crafters and other vendors. Food and refreshments available at the pavilion where we will have The Quarry Road band preforming. The 10th Year! Memorial Tractor Pull in honor of Jim Bristol, Sr.
All are welcome. We gladly accept donations – $5 suggested at the gate. Tractor Pulling starts around 9am, food vendors, lots of Tractors, Trucks and other cool stuff to check out. 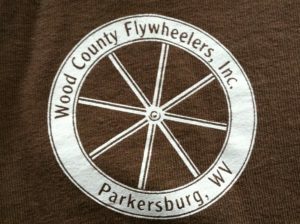 Saturday (May 25, 2019) Fun Day – This is an unsanctioned event. Tractor games start at 1:30 pm. Sunday (May 26, 2019) Weigh in 8 – 10 am. Pull starts at 11 am. 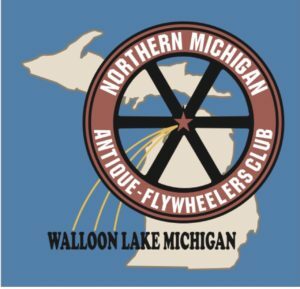 After the pull on 5/26 there will be a General Membership Meeting with a potluck after the meeting. Meat will be provided. Please bring a dish/dessert to share. Monday (May 27, 2019) Weigh in 8 – 9 am. Pull starts at 10 am. the site of the Muskegon County Fair Grounds, Fruitport, Michigan. 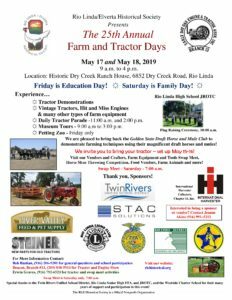 Activities include tractor pulls, Ford Model A swap meet, children’s activities, flea market, food vendors, toy displays, sawmill, early days’ equipment demonstrations, “valve cover” car derby, tractor/truck parade, bonfire & marshmallow roasting. Farm toys and family fun will be on hand in Dyersville, Iowa on the first Friday and Saturday in June. Kicking off the show is the annual 50 Mile tractor ride is heading to Manchester! 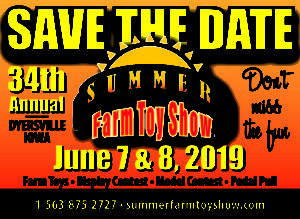 The Summer Farm Toy Show also includes a Farm Toy Display contest that the public can vote for their favorite display on Friday. Don’t miss the fun and colorful Tractor Parade on Friday night. For more information about these events contact the National Farm Toy Museum at farmtoys@dyersville.com or 563-875-2727. 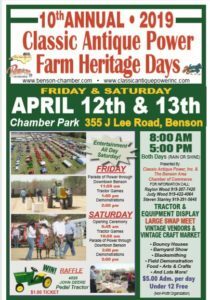 Come out and see tractors and equipment from across the last 100 years! See tractors that worked the fields to provide food for your parents, grandparents, great grandparents and more to tractors from all different parts of the US. From farm functional to fully restored pieces experience the history that has become as important as the iron itself! The show will be held in conjunction with the Locke Firemen’s Field Days at the Locke Fairgrounds. 6pm-Dark Wednesday – Thursday and all day on Saturday. 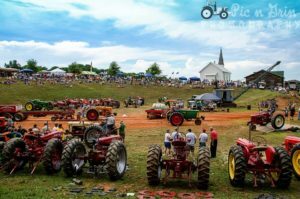 The greatest steam, gas and antique farm machinery show in the southeast! Numerous farm machinery demonstrations with horses steam and gas powered. Restored buildings including a grist mill, general store, church, tramping barn, gas station, shoe shop, radio museum, Coca-Cola museum, doll museum, and more! 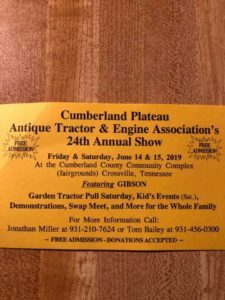 Antiques, crafts, tractor pulls, horse pull, lawnmower pull, border collie demonstrations; full size steam train rides, music, food and fun for all ages! 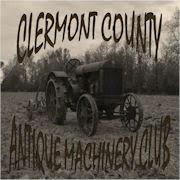 Join us and enjoy reminiscing about old tractors and farm equipment from life back in the day. Attendees will see many tractors of all sizes, shapes and colors – all tractors are welcome. Some are pretty, some ugly as they arrive in their “work clothes”! 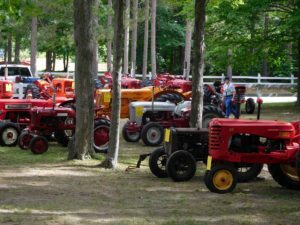 Rock Falls antique tractor and engine show is a 1 day event with all kinds of old tractors, garden tractors, and engines. The feature tractor this year is a farmall 1206. The event is free and great for all ages. There is also vendors at the event. Steiner is one of our sponsors every year with lots of give aways. There is a Facebook page that has all the information for the show and is updated on a regular basis. Located in the beautiful Pastime Park in Plain City, Miami Valley Steam Threshers 70th Annual Show and Reunion will feature Oliver. You will be able to enjoy not just our large display of tractors, steam and gas engines, but also watch them being used in our demonstrations throughout the day. 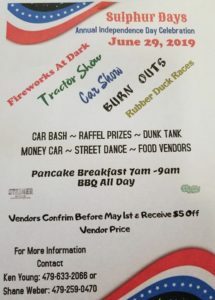 Nightly entertainment includes tractor games, lawn mower pulls, a grand parade through downtown, steam engine spark show and tractor/truck pulls, all included for $5 admission. 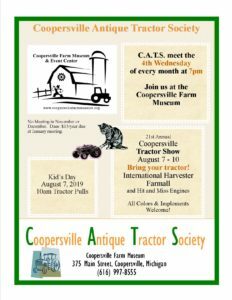 Features antique farm equipment, homemade ice cream using antique churns, tractor rodeo, tractor parades, model train displays, kid’s activities, blacksmithing, and more! 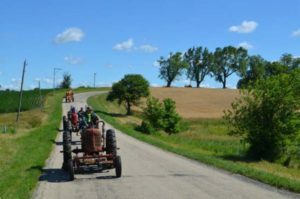 Antique Tractor Show and 35 Mile Tractor Drive. Show Saturday, Drive on Sunday; Saturday evening Baron of Beef Dinner for all exhibitors: Rocking R Ranch, 32317 NE 11th St, Carnation WA; Northwest Vintage Iron Club, EDGE&TA Branch 36, Contact Phil Scott pascott41@msn.com, 206-388-9895. 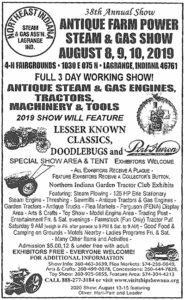 Our local Antique Club holds our show with our County Fair. We have a working Frick sawmill,. with two demos each day. 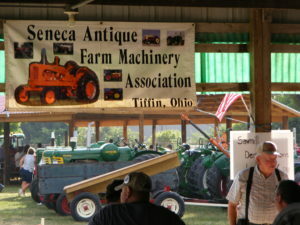 Antique Tractors and Small Engines featuring all walk behind tractors and gas and electric power plants. Steam Engines, Tractor Parade, Tractor Safari, Flea Market, Antique Autos and Filling Station, Food, Two Music Venues, Arts and Crafts Sales and Demonstrations, Blacksmiths, One-room Schoolhouse, Museum, Barbershop, Saw Mill, Veneer Mill and Basket Factory, Grist Mill, Tractor Drive-in Movie, Farm Museum, Farm Apparatus Displays, Scale Train Exhibit, Lathe and Rope Making Demonstration, and much more. Pioneer Cabin restoration in progress. 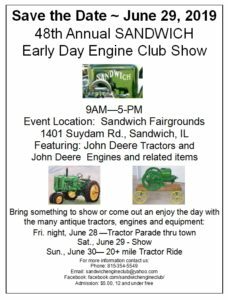 For the club’s 27th annual show we are featuring antique lawn and garden tractors and Economy engines. We also have demonstrations, tractor pulls, kids’ tractor pulls, a bluegrass festival, a vendor market and plenty of good food! 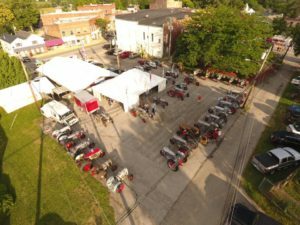 PA – Allegheny Mountain Engine & Implement Show & Demostration @ Allegheny Mountain Engine & Implement Assoc. 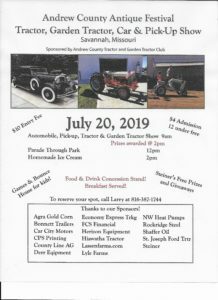 Steam and Gas engine displays, threshing, sawmilling, antique trucks, shingle mill, tractors, Oil Pulls, flea markets, Friday nite tractor pull, Saturday evening horse pull, equipment parades Sat & Sun noon. Fields of Steel. Featuring steel wheel and track type tractors. Featured engines Fairbanks Morse and Monitor. All types and colors welcome! Find us on Facebook Central Illinois Farm Heritage Tractor Club or Princeville Heritage Museum. Tractor and Engine show. Working sawmill, threshing and baling, corn shelling grainery, hit and miss engines. Swap meet and vendor items. Over 150 tractors every year. Hours 9- 5 daily. Admission $6.00 senior day Thursday, kids day Saturday. 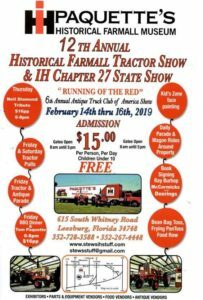 Join us for the 31st Annual Silver King Tractor Festival, hosted by the Silver Kings of Yesteryear Club in celebrating the history of Silver King & Plymouth Tractors. 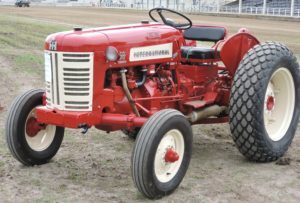 In 2019 is the 85th anniversary of the Plymouth tractor. Parade 7pm Saturday evening. Club Breakfast & Swap meet 8am Saturday. Local hotels are within 10 minutes. This event is also held during the Plymouth Volunteer Fire Dept Annual Chicken BBQ. Setup is Thursday all day, tractors are welcome any day and stay for the day as well. Trailer parking is available as well. FRIDAY – BLUE MAX, SATURDAY – KING OF THE MOUNTAIN PULLS. 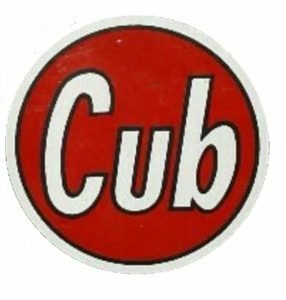 All days flea market, print shop, wood shop, antique gas station and cars, drag line exhibit, steam and hit & miss engines, live entertainment, food vendors and ice cream shop. Watch Wheat threshing, binding done with machines from the 30’s and 40’s. Baling straw with a 1919-1920 baler, using wire. 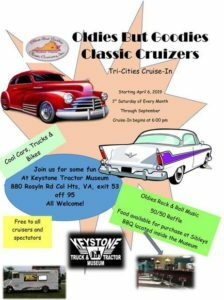 Wagon rides, children’s games, Kiddie Pedal Pull , and good food. Tractor displays and Gas Engine displays. 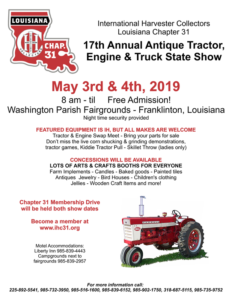 Tractors and old equipment will be on display! We had 83 tractors on display last year, our display start on Aug 6TH -10TH. Wednesday evening will be tractor parade at 5 o’clock before the big badger state tractor pull come on down! Free outdoor show – all makes, models, and colors welcome – hit n miss engines too. Wednesday Kid’s Pedal Pulls at 10am. Cruise through town on Thursday night. Car Show in town on Saturday until 3pm. Live Music Saturday 10am-1pm. Daily demonstrations of Sawmill, Shingle Mill, Threshing & Baling, antique tractors, steam engines and antique farm & logging equipment. Enjoy Music in the barn on Fri & Sat evening. Food concessions in the clubhouse. ALL EXHIBITORS ARE WELCOME & FREE. 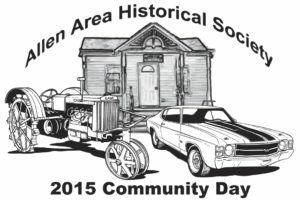 MN – Days Of Yesteryear @ History Cneter of Olmstead Co.
An all week-end Community Fest including our Tractor Show and a 30+ ride on Saturday with a parade on Sunday. 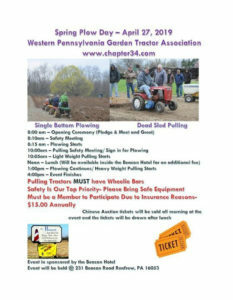 The 45th annual CCAEA show will feature Garden Tractors and Implements and Chautauqua County (NY) Engines. Free Parking, and Demonstrations throughout the show including saw mill, crafts, print shop, machine shop. An auction will be held Saturday Morning. Antique farm tractor and Garden Tractor parades, games and pulls occur daily. A steam powered “Threshing Bee” on a family farm, featuring steam powered grain threshing, steam powered saw mill, snow fence making machine, stone ground flour mill, antique tractor pull, kiddie pedal pull, flea market, tractor display, gas engine display, blacksmith shop, shingle mill, Sunday prayer service, live music, raffle, saw dust coin pile for kids, train rides for kids, slow tractor race. Pancake breakfast, parade, country store, food vendors. Huge show thousands of engines, 800 tractors featuring lesser know brands, excavating equipment, live demos, sawmill, acres of parts. Hosting the Gravely Tractor Club of America 23rd annual Mow-In. Something for everyone. Free parking and exhibitor admission. Gravely tractors and equipment from the 1920s to the present day. Two 40 x 80 tents of exhibits. New and used Gravely parts and used tractors. Very knowledgeable people to answer technical and historical questions. Held in conjunction with the 54th annual Tri-State Gas Engine and Tractor Show. Admission to the host show is $5. Exhibitors are admitted free of charge. Agricultural Museum: Tour an eclectic collection of antiques and artifacts. Antique autos show: Featuring cars from 1900-1935. This informal gathering of car lovers celebrates the early years of the automobile . Antique Village: A variety of shops and working displays offer insight into the past, with an emphasis on regional history. Local artisans demonstrate traditional handicrafts, and many of their creations are available for purchase. Indoor/outdoor flea market: Visit one of the largest flea markets in the Upper Peninsula. Dozens of vendors offer a wide variety of items for sale. 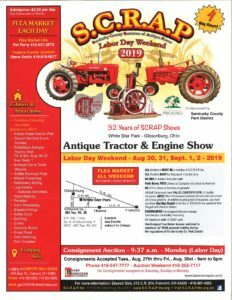 Our 36th annual Antique Engine and Tractor show will be held Thursday, Sept. 5 through Sunday, Sept. 8, 2019. One of the largest shows of its kind in the state, the event draws hundreds of antique tractors and engines collectors from all over the country. Working displays like the shingle and sawmill, exhibits like the Farm History Building and of course, parades, games, crafts and a huge flea market are all part of the show. 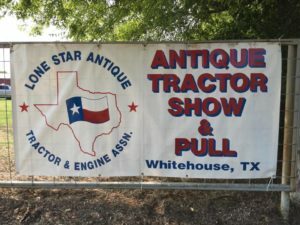 Yearly show featuring Steam Engines, stationary engines, sawmill , molasses making, flea market, kids train rides, tractor/truck pulls, horse farming, blacksmiths, small engines, camping, free parking, tram rides, kiddie tractor pull, horse pulls, walk-on-sled pulls, general store, homemade ice cream, BBQ dinners, lots of food vendors. $8.00 admission all weekend, kids under twelve free. The Clinton County Corn Festival is a family fun event held the weekend after Labor Day every year! Started in 1977 by the Antique Power Club. 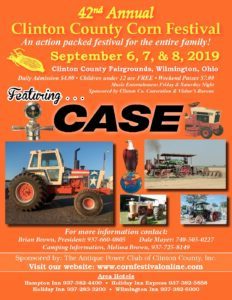 It is held at the Clinton County Fairgrounds in Wilmington, Ohio. We feature many activates for all ages! 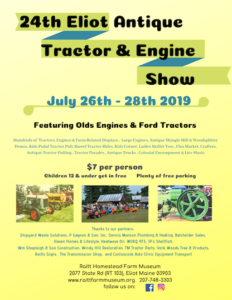 Whether you come for the continuous entertainment on our sound stage, games in our special events area, various tractor and antique displays, crafts and antiques, or THE FOOD it is sure you’re going to have a blast!! Friday, September 6th Tractor ride. 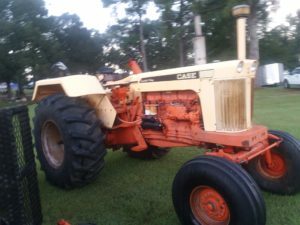 Saturday, September 7th Antique auction, FFA tractor driving contest, demonstrations threshing, corn shelling, corn chopping, baling, parade of power. Sunday demonstrations threshing, corn shelling, corn chopping, baling, parade of power Drawing for International Harvester 350 Utility tractor. Our parade is a fun celebration of our small town! Local businesses, bands police/fire departments, clubs and more showcased in the hour long parade through town. Come down and cheer on our local competitors in this classic event. 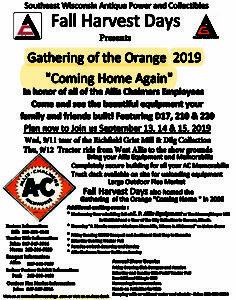 Featuring Allis Chalmers! 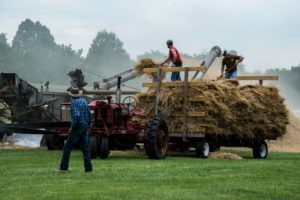 Celebrating the 36th Annual Threshing Festival! ALL Tractors Mowers and Vintage Equipment Welcome! LASTEA annual show. Parade, Kids events, engine display, Tractor pull, and auction. 3 full days of FREE family fun! Craft and food booths, Live Music, Mid-way and Helicopter Rides, Festival Parade, Truck & Tractor Pulls, Vintage Farm Machinery and Antique Tractor Exhibits, Contests for all ages and so much more! Thanks to all the patrons, volunteers, participants and vendors for helping making 2018 another successful festival! 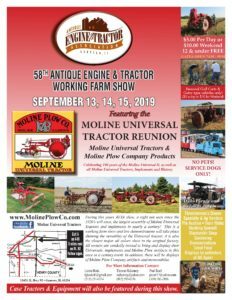 During this year’s AE&TA show, a sight not seen since the 1920s will exist, the largest assembly of Moline Universal tractors and implements in nearly a century just miles from the Rock Island factory where they were produced! This is a working farm show with live demonstrations showing the versatility of the Universal tractor. 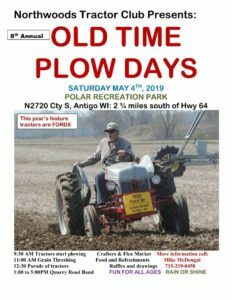 All owners are invited to bring their Universals and Moline Plow implements and memorabilia to this once in a century event. Also featuring Case tractors & equipment – all Case owners are invited to bring there equipment to the show. Admission is $5/ day or $10 for the weekend pass.